You may have remembered my Youtube Video on this quiche? Well if you missed it check it out below. Then follow the link for this great recipe and use cupcake tins to make individual quiche. Perfect for an appetizer when you want to make something special. The perfect bite size quiche that takes hardly any time to make. Eat healthy and lower your carb intake! One of my favorite vegetables during the summer is zucchini. Quiche is a light delicious brunch or even dinner for me. I am more of a vegetable than meat eater. Actually, I hardly ever eat meat. Why? Well for starters everyone has had bypass surgery sibling wise in my family. Mom and dad passed from heart problems, my Aunt had bypass, brothers both had bypass. Now I maintain my carb intake, eat more vegetables and fruits and avoid anything that has high cholesterol. I didn't eliminate everything, just in moderation, we don't eat pasta three times a week anymore. It really is very difficult to eat healthy when you grow up eating delicious pasta in an all Italian family. We always had fabulous Italian rich pastries and lots of carbs. also have high blood pressure which is all hereditary and eat low sodium. In most of my recipes, I will substitute lower fat but check the sugar content, it doesn't mean it lower fat if it sugar laced! The sugar is a carb that turns into fat! If you prefer a crust, I have also provided the recipe below. This one is crustless. The little cupcakes are packed with delicious cheese and garlic flavor. Enjoy the quiche, it's healthy and delicious! Optional additions or substitutions: sliced ​​mushroom, sliced ​​eggplant, sliced ​​onions, chopped broccoli, chopped spinach, broccoli rabe or cauliflower can be used instead or mixed to 2 cups of vegetables medley. Mix everything in a bowl except tomato. Place in oil sprayed tins. (Line with crust if you prefer first) Place tomato on top of each cupcake. Bake at 350 degrees fir 35 minutes or until middles are set. Mix until dough forms. Line cupcake tins thinly. . Add the mixture into the tins and bake for 35 minutes or till browned on top. 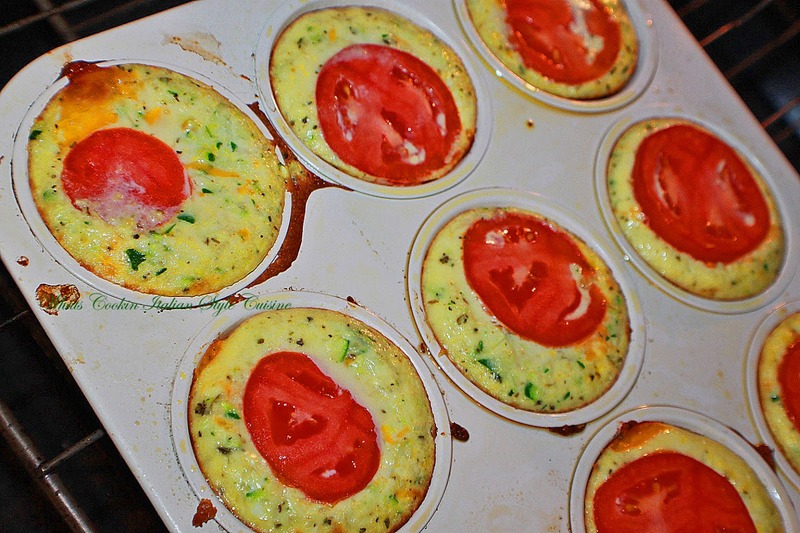 The filling makes at least 16 individual quiches. I am particularly admiring those beautiful red tomatoes on top of the quiches. Making me wish tomato season was here! Looks like a delicious breakfast! So inviting and delicious cupcakes. 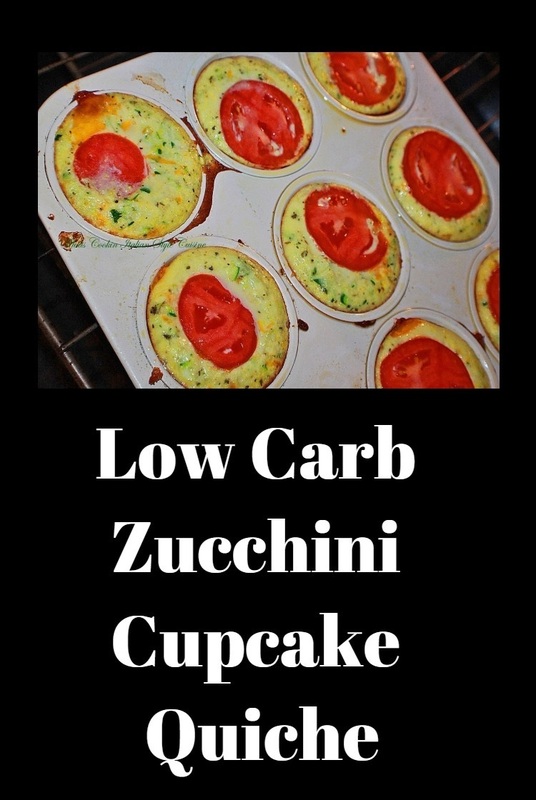 I am not a great fan of zucchini but I should try this for my husband who loves zucchini in all his food. Thanks for sharing ! I like that these mini quiches are low carb!